One day, my 8th grade art teacher decided to try and teach his class sumi-e, the Japanese art of Ink wash painting. It's a minimalist style with a long history and subtle philosophy behind it, not exactly the best thing to try and show a bunch of distracted adolescent kids. He told us to be very conscious of how we painted and what we were painting, but also to try and think about it as little as possible. The brush strokes weren't supposed to represent subject at hand, they were supposed to reproduce its essence. None of us were very good at it. Most stopped trying after the first day. In the classroom next door you could hear Bruce Springsteen play on an old boom box while everyone worked on collages. The only sounds coming out of Mr. Ging's class were his exasperated sighs and disappointed grunts as he inspected one failed painting after another. 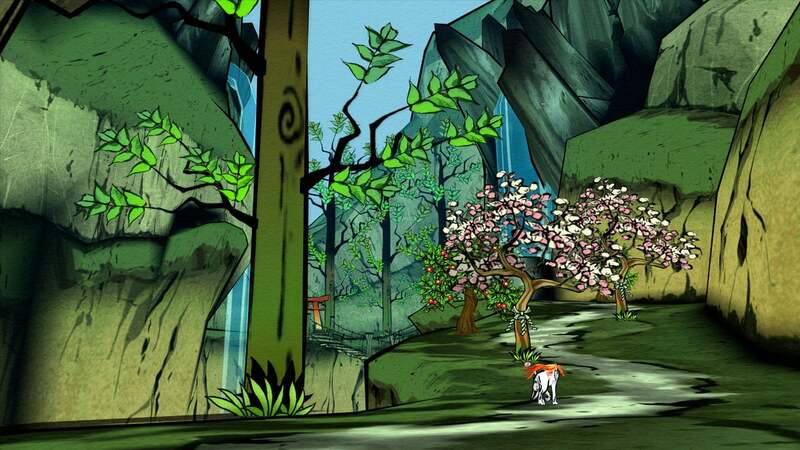 By almost any measure, Ōkami is a beautiful game. When it came out ten years ago, few people had seen anything like it. Nothing like Journey existed. The explosion in smaller, independent art-driven games was still a ways off. 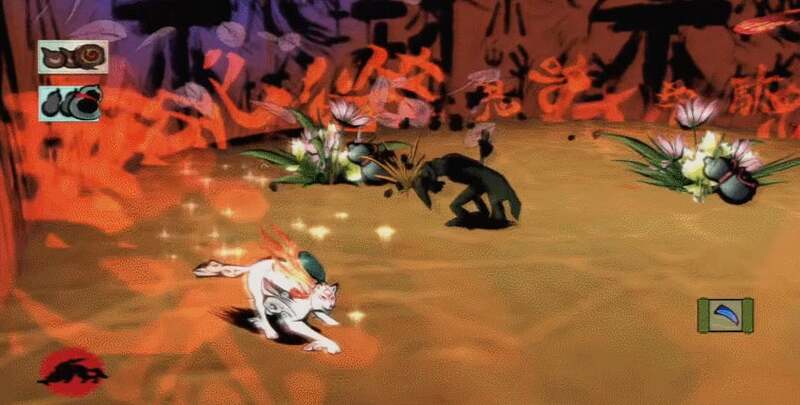 In 2006, Ōkami was something of a four-leaf clover in a field of weeds. It felt more intentional than a lot of the games that surrounded it. Above everything else, it was rare, the type of game you called up a friend to tell them about. "Come over here right now. Yes, I promise you haven't seen anything like this." The game's sumi-e inspired style goes beyond providing it with surface level appeal and is instead integral to the way you play the game. You play as the mythical Amaterasu, a goddess given the form of a wolf, who must use her celestial brushstrokes to save nature and restore harmony to the world. These brush strokes can fix bridges, cut down enemies, and even create flames. With the simply flick of the analogue stick players can have their ideas manifested in the world displayed in front of them. As much as Ōkami felt like a game made rich by the art and culture of Japan, it was also quintessentially game-y idea. Almost everyone loved Ōkami at the time. Praise for it was near universal, even though sales were not. The company behind it, Clover Studio, had to fold as a result. The people who worked on the game all went their separate ways. Some of them went on to form PlatinumGames and do great things, while others joined Ignition Entertainment and eventually released El Shaddai: Ascension of the Metatron, a game that looks beautiful and hypnotic from afar but is decidedly less so after several hours. 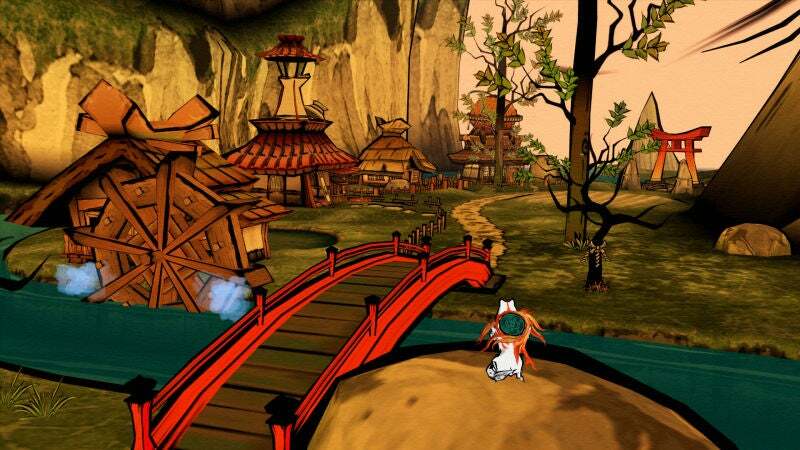 On the eve of its 10th anniversary, it's hard not to feel like the same problem applies to Ōkami. The game is too long by half. At 40 hours for the main story alone, the game feels bloated by modern standards. You can earn money in the game, which can be spent on items and weapons, as well as upgrades to your abilities. Except that Ōkami is not a game about combat. The game is at its best when you're solving puzzles to unlock its mysteries. Ten years later, Ōkami feels like a victim of its time, polluted with extraneous mechanics and dry dialogue simply as a way of justifying its artistic endeavours. Almost nobody talks about Ōkami without mentioning The Legend of Zelda, and it's easy to see why. Too often the game seems intent to chase after the shadow of the latter, parsing its world into dungeons and villages as a result. It didn't help that Wind Waker came out only a few years before. The two games could easily be mistaken for siblings, both sharing a certain breezy, cell-shaded aesthetic that was, and is, all too hard to come by. Like a younger brother though, Ōkami made the mistake of trying to follow too diligently in the older's footsteps. Just because Link had been going into dungeons to slay monsters and collecting myriad knick-knacks along the way, didn't mean Amaterasu needed to do the same. It's understandable though why, at the time, Clover Studio felt like she had to. On the third day of Mr. Ging's class, I opened one of his books to a page filled with pine trees and dipped my brush into some ink before loading the rest with water. For a second I let the brush strokes guide my hand rather than trying to force each one of them to create the lines I thought I wanted. Within seconds I had two evergreens standing side-by-side against the shadow of a mountain. I felt relieved. And so did Mr. Ging. "It's not terrible," he said. I remember him framing the piece with a black border and hanging it in the student art show. I don't think anyone else quite liked it much. It certainly didn't win any awards. I still have it to this day, and though the memory of what it looked like when the ink first dried to my 13-year old eyes has long since faded, I can still make out a tiny glimmer of what made it special. This article hasn't got an IGN watermark on it, what's going on here. Explain the ending to me, please. I didn't understand what they were doing in the spaceship but I also didn't really mind. Okami dropped her trousers to reveal she was actually a guy the whole time, and when she stopped limping you realised she was Keyser Soze (Luke Skywalker's father), and everyone else was a ghost because she saw dead people. I'm too impressed to be mad right now. Most people consider the defeat of Orochi the real ending. If I remember right, the spaceship was a representation of the ascent to heaven? I did a quick bit of reading, apprently Ammy and Waka had descended to Earth to destroy Orochi after they kicked him out of the celestial plane. In the descent, the ship crashed and all the gods were destroyed except Ammy and Waka. So by returning to the spaceship, they are going to return to the celestial plain. They also need to get the people believing in the god. It's used a bit in Anime, but if a god is ignored, it will fade and eventually disappear. This also happened to the other gods (or something). Issun's job as celestial envoy is to make Ammy powerful. The spaceship has somethign to to with this. I have no idea how, but it has something to do with a sapling. I totally don't even remember anything about a spaceship. I'm certain I did finish the game though. The last boss takes place in front of the spaceship, but it's not featured for very long. Extraneous mechanics and dry dialogue? Not sure if we played the same Okami. So much this, with one exception: those goddamn walls where you had to hit all the random points in order perfectly to break them. Screw those guys so much. The last one of those took a few hours for me. Last time the only way I could beat it - and this took like ten attempts even so - was to use my phone to record it and then replay the sequence. flick of the analogue stick ??? Play it on the Wii where you can actually make the brush strokes. Agreed. It's a must play on the Wii; it was an absolutely masterpiece. I rank it in my top 10 favourite games. Sadly, though, the DS version, Okami-den, didn't have the same charm for me, despite being a much better-suited console for the concept. It was just the same game again really. The Wii version's quite compromised in other areas, sadly. The PS3 'HD' version is probably the definitive version. I was unaware they did another release of it. I played the whole thing through and it seemed fine, but then again, I had nothing to compare it to. They removed some stuff, like cutting the entire staff credits reel and removing the rice paper filter over everything that reduced that painting feel. There's also other bits and pieces that were cut out or tweaked. Also depending on how you feel about waggle, the Wii controls aren't as good for actual gameplay (and I found the brush stuff to be frustratingly hit & miss, not that the PS2 was much better). PS3 is graphically the best of them since it runs at a really solid, high resolution and has the paper effect, plus has all the content of the PS2 version except the end credits song. I tried playing it on the PS2 after listening to all the ranting about how amazing it was. Despite enjoying Japanese mythology and artwork, I just didn't enjoy the game and gave up after a few hours. The artwork and gameplay just did nothing for me. The game is too long by half. I see this repeated a bit, but I disagree. What would you cut? It's deliberately a game in three acts because each act is based off a different mythological source. The first part is sourced from ancient mythology (mainly the Kojiki and Nihon Shoki), the middle part pulls from more modern folklore, and the final part concerns the mythology of the Ainu. Cutting part of it would be missing the point. There might be a few bits that could be pared down a little, but you'd lose a lot of the flavor as a result. About the only part that really feels like fluff is right at the end when you have to beat the bosses again. A bit tedious. But if you know what you're doing that's like half an hour at the most. And that ending really makes up for it. The music and everything. I really hope someone at Capcom remembers about Okami and gets it onto a more modern system. It being digital-only on PS3 (the PS3 version being the best) terrifies me that there might come a time when I can't play it again. It has its flaws just like any other game, but calling it 'fatally flawed' is a bit much, surely? I think it did Zelda better than Zelda, and I think it needed its length for the story to work. It was very much broken up into parts and I don't think any of them could have been cut out. My only major complaint about the game (and this isn't an 'oh it's a bit annoying' complaint, it's a 'this is actually ruining the rest of the game for me' complaint) is the stupid digging mini game where you have to go underground and find your way to the bottom. It's the worst. Ah the years haven't erased the automatic chain of thoughts I get whenever I see the word sumi-e.
Sumi-e -> Ukiyo-e -> Samurai Champloo -> That baseball episode -> Snort.